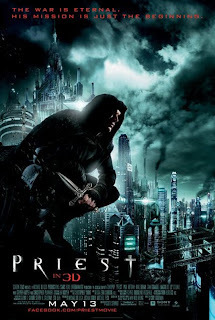 Set in a post apocalyptic time, long after the wars between vampires and humans subsided, refugees were placed in cities that belong to the church and where the churches words are God’s word, priests were warriors that battle and ensure the victory against the vampires a long time ago, but was stripped of their duties because the council were afraid of their powers, but evil returns and then comes a tale of a hero trying to find his niece. The movie is a adaptation of a Tokyo manga of the same name, its not main stream but many fans knew about it, and in my opinion though the characters and details were done nicely it lacks the pressure and tension of the original manga. The director of the movie did not get into the feel of the manga that would have leveled up the intensity of the film, although the vampires and gadgets were cool and all , the action sequence was a bit blurry and too fast pace for anyone to feel the sense of anxiety a movie like this should have, it could very much well be way better . Maggie Q and Lucy Collin did their role well in playing the role of a priestess warrior and a kidnapped girl. Maggie Q has gone a long way from her old films and I m pretty sure we will be seeing her more often in movies to come and as for Lucy Collins, I would prefer her more than Emma Watson simply because she has better depth in character and acting.